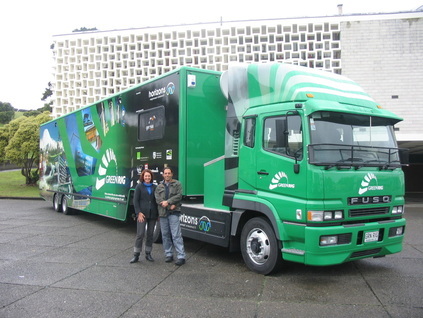 ​A unique mobile classroom and eco-exhibition space on green wheels! ​Bettina was the project manager and provided conceptual development leadership for the creation of this innovative custom-built eco-exhibition space on wheels. A challenging project that involved raising $0.75 million of funding, managing a team of up to 30 different contractors involved in the design and build; and commissioning and completing the entire project in under 18 months from start to finish. Described as part cell-phone and part swiss-army knife the RIG boasted a satellite internet connection, video conferencing facilities, virtual reality touchscreen exhibits and video microscope - along with more traditional exhibits like a hands-on erosion table and native biodiversity dioramas. The RIG was decommissioned in 2013 after 5 successful years on the road and 120,000+ visitors through the doors.